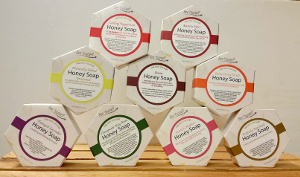 Our soaps, like all our other products, are made with natural ingredients: Saponified Oils (Vegetable Oil, Olive Oil, Coconut Oil, and Beeswax), Honey, Texture (in certain soaps -- see below), and Essential Oils (in all soaps except Natural). The list price on soap is $6.00/bar. However, if you purchase 4 or more bars, the price drops to $5.50/bar. Purchase 8 bars, and it drops to $5/bar! It's like getting free soap, so stock up! For the pirates in our midst! Made near the headwaters of the Chesapeake Bay, our Bay Rum Soap contains the enticing scent of bay leaves sweetened with oranges, offset by the spicy headiness of cloves. A touch of cinnamon adds texture and scent.